From today we’re offering a frozen breaded fish range that is free from the allergens gluten, wheat, dairy, egg and soya. 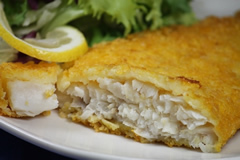 We’ve joined forces with Feel Free For Gluten Free to bring fish lovers with food intolerances and coeliac disease doorstep deliveries of their breaded fish products. Feel Free For Gluten Free’s breaded fish range is made from 100% fish fillet and coated in a crispy maize crumb. Cod fillets are available in packs of two fillets, prices at £5. 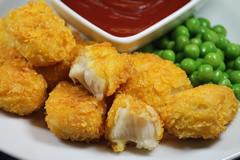 The nuggets, made from Alaskan pollock fillet, are a popular teatime treat for children with food allergies and intolerances – a pack of nine nuggets is priced at £2.75. Both products are convenient meal options that are quick and easy to take out of the freezer and prepare. Recommended to be baked and not fried, they are healthy too. Feel Free’s Managing Director Sally Allister says, “We’re full of pride to be Regal Fish Supplies’ first choice for free from fish products. “We launched our breaded cod fillets and Alaskan pollock nuggets earlier this year having spotted a gap in the market for good quality, breaded fish products. In particular we noticed there wasn’t much choice for parents searching for frozen fish products for children with multiple food allergies and intolerances.